This chenille tapestry "Statuette Urn" shows a gloriously ornate urn on an ancient pedestal. Here in this piece, we see an urn in reds and golds, shows Roman and Greek figures and motifs. The pillar pedestal is also decorated with Greek god and mythical creature designs, all surrounded by an ornate floral, foliage and architectural border. The color palette in this chenille tapestry is classic and beautiful. 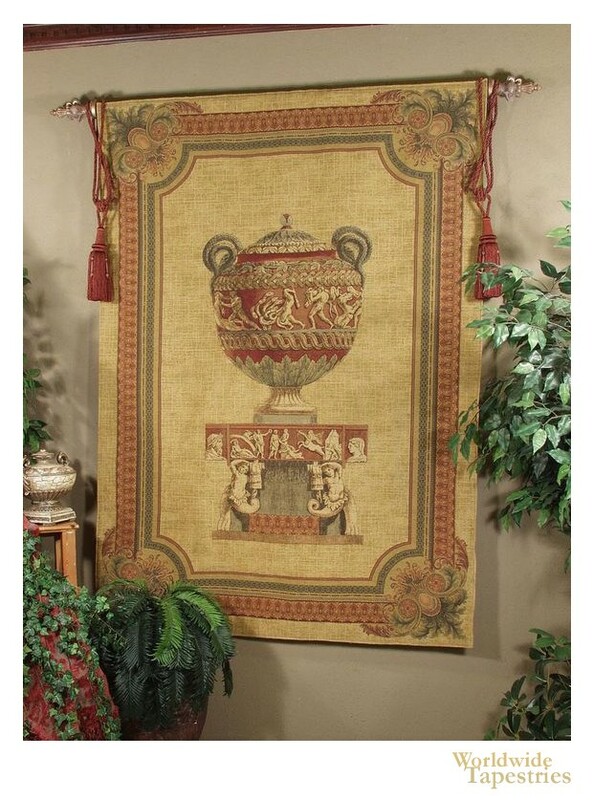 Its companion piece is the "Urn On Pillar Gold" tapestry. This Belgian tapestry "Statuette Urn" is backed with a lining and has a tunnel for easy hanging. Note: tapestry rod and tassels, where pictured, are not included in the price. Dimensions: W 53" x H 74"